Green Tea for Weight Loss: What Kind is the Best? Tea is a popular and very old beverage, originating in China about 4,000 years ago. Green Tea, known scientifically as Camellia sinensis, is one of the most sought-after types of tea due to its manifold health benefits. Besides having great anti-oxidant qualities, this all-natural supplement is also renowned for its slimming characteristics and can be used in the weight loss battle to get rid of extra pounds. Green tea consists of two primary, potent components: caffeine and a compound called EGCG. Together, the two increase metabolism, burn calories and prevents the absorption of carbohydrates.
. As a result, the body is unable to store extra carbs, which is why most of them exit the body. With green tea, the fat-burning process begins at 400 mg of EGCG consumed, which is equal to approximately 8 cups of tea (1 cup containing roughly 50 mg of EGCG). What are the best green teas for weight loss? The best green teas for weight loss are Vahdam Teas, Total Tea Herbal Green Energy, Yogi Herbal Tea, Lipton Green Tea, and Celestial Seasonings. Today, green tea is available at every health food store, Walmart, and even the farmer’s market. This organic green tea is handpicked by professional tea pluckers in the region of Darjeeling, near of the Himalayan Mountains, at an average altitude of 1800 meters above sea level. 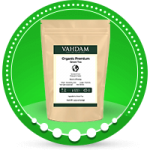 The Vahdam Green Tea was carefully grown in high-quality soil in this majestic area, which added great nutritional qualities to the Green Tea leaves. This organic tea does not contain artificial flavors, colors or other ingredients that could jeopardize its quality. It is sold in the loose leaf form, which helps retain crucial vitamins minerals and antioxidants that help you kick start your day and may even help you lose a few extra pounds. Total Tea Herbal Green Energy is one of the best green teas on the market specifically made for health benefits. This highly sought-after drink is rich in natural flavors, vitamins, and minerals that can help improve your energy levels, enhance your metabolism, and spruce up your daily life. It is naturally packed with caffeine and antioxidants to boost mental focus and physical performance. Total Tea Herbal Green Energy also contains unique ingredients such as cinnamon bark, which has antiseptic properties, eleuthero root, which is an immune system stimulant, and ginseng root, which stimulates the endocrine system. It tastes great and will make you feel fantastic. Slim Life Green Tea is uniquely formulated to provide energy and vital minerals the body needs. It is an all-natural, organic tea containing Garcinia cambogia fruit extract, ginseng, and eleuthero extracts to support stamina. 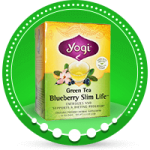 With regular exercise, a healthy diet, and regular consumption of Yogi’s Blueberry Slim Life Green Tea, great weight loss results are guaranteed. The Lipton Tea brand is renowned all over the world for its pure and simple flavors. Lipton’s Green Tea was made of the world’s finest green tea leaves, with no artificial ingredients. This calorie-free, Rainforest Alliance certified tea is guaranteed to provide a great energy boost in the morning and help you conquer your daily tasks. The Lipton Green Tea also contains 165 mg of tea flavonoids per 8 fluid oz. Celestial Seasonings is one of America’s most beloved tea companies and is based out of Boulder, Colorado. It was founded almost five decades ago, in 1969, and has striven to provide the best quality of herbal teas since. 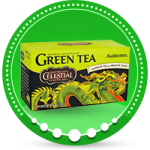 There are two variants of exquisite Celestial Seasonings Green Teas: “Green Tea—Antioxidant” and “Green Tea—Authentic.” Both of these teas contain natural lemon and orange flavors with other natural flavors like rosehip, vitamin A and C, eleuthero, and roasted chicory. This high-quality Green Tea goes perfectly with breakfast, lunch and even dinner. It can also help you shed a few extra pounds.